Buying property that you wish to restore and enhance in Italy has long been synonymous with headaches, heartaches and years of frustration. Ask anyone who has tried to “go it alone” and they will tell you about the tangled web of bureaucracy, the snail’s pace of contractors, and the unfortunate surprises that happen when you try to bring a 400-year-old home up to 21st century standards. They will tell that it is a lot like Under the Tuscan Sun … only worse. But it doesn’t have to be that way. For many, the dream of owning property in Italy — especially in the Tuscan countryside — is too powerful to resist. Yet countless barriers often make this dream seem like a mirage. And as writer Nicholas Farrell soberly put it when sharing his personal experience in a column for The Telegraph UK, “you have to be patient otherwise you will go insane.” Farrell’s efforts to buy a five-bedroom home near Ravenna were meticulously chronicled in a separate article, in which he details the previous 15 months of agonizing back-and-forth with the seller, the surveyor, and the local authorities, all because of a centuries-old barn without modern-day documentation. Ultimately, he was presented with three choices: tear down the beautiful building, back out of the transaction, or keep pursuing legal action. Rising from the morass of Italian second-home ownership is Casali di Casole – A Timbers Resort. The 4,200-acre estate west of Siena is a clear alternative with its latest offering – The Farms. Scattered across the sprawling estate, these 100- to 160-acre farms can be purchased, renovated and customized completely to the Owner’s exacting standards — with all the paperwork and contractor consulting handled by Timbers Resorts. And while Casali di Casole has won recognition for its preservation efforts across the estate, Owners of the farms can have significant leeway to design these homes the way they want. The farms include vineyards, olive groves, fruit orchards and wheat fields, all situated around a luxury farmhouse that serves as a genuine escape from it all. Add to this the prospect of enjoying all of the resort amenities and fine dining at Casali di Casole — which was recently recognized by the readers of Travel + Leisure as the Best Resort in Europe and best Hotel in Italy for the 5th year in a row — and Owners at The Farms have it all. Except for the headaches, that is. Discover ownership opportunities at The Farms at Casali di Casole, as well as full ownership of villas, by visiting our website and contacting our team to arrange a visit. For the fifth year running, the readers of Travel + Leisure Magazine have recognized Casali di Casole — A Timbers Resort as the best resort in Europe. Scoring an impressive 97.12 out of 100, the magnificent 10th century Tuscan estate — which Timbers Resorts converted into a luxury resort — was recognized for its environment of supreme relaxation. We are honored to receive this distinction for the fifth year in a row, especially since it comes from the most important judge: our guests. T+L Readers once again took note of Casali di Casole’s exceptional food and beverage program, particularly the delicious meals at Ristorante Tosca. Praise was also extended to the spa, as well as the overall atmosphere of a preserved Tuscan estate — “like a small fairy-tale village,” as the editors of Travel + Leisure describe it. However, the biggest reason Casali di Casole tops the list as the best resort in Europe is the balance the hotel strikes between accommodating couples and families. Those seeking a romantic escape can easily find it, yet our tailored and welcoming service makes families feel welcome throughout. This is something we strive for at all of our properties, and to hear our guests take note of it — and award us with such an honor — is deeply humbling. Rachel Nettles (Managing Director - Marketing) and Edward Shapard (Managing Director - Hospitality) at the Travel + Leisure World’s Best Awards. In addition to being named the Best Resort in Europe, Casali di Casole was also honored as the Best Resort in Italy and the No. 22 Hotel in the World. We wish to extend our sincere congratulations and appreciation to the incomparable staff at Casali di Casole, who make the dream of a luxurious Tuscan retreat into an unforgettable experience for our guests and Owners — memories that they will cherish for a lifetime. We’re also excited to share that The Sebastian – Vail was ranked the No. 9 Resort Hotel in the West by the readers of Travel + Leisure Magazine. We are deeply honored by this distinction and wish to extend our appreciation to the talented and gracious team that make The Sebastian standout as one of the Best in the West. Our Owners have an insatiable appetite for authentic experiences. To showcase the Tuscan lifestyle available at the secluded and private Casali di Casole, we invited them to join us for a four-day culinary adventure. Here, in the Tuscan hills just west of Siena, they enjoyed interactive culinary-themed activities and wine tastings, magnificent Italian cuisine courtesy of Chef Daniele Sera, as well as time to enjoy spa treatments and countryside escapes. On April 25, Owners arrived and were greeted with an apertivo reception by the Casali di Casole pool terrace. Mild spring weather set the tone for canapés, hors d’oeuvres and wines from the estate. As the sun set, everybody moved to the historic Visconti Bar for a light three-course meal that featured Insalata di polpo (octopus salad), ribollita (Tuscan soup) and tiramisu. Tuscan wines are among the most distinctive on earth: a rich, swirling blend of red and black fruit, oaky tannins and slightly bittersweet edges. Many of our Owners were at least familiar with these wines, but as any aficionado will tell you, tasting a wine in the setting where it is made changes everything. Our Taste of Timbers trip included two wine tastings. First, owners were presented a tasting of the Casali di Casole estate wines with winemaker Paolo Caciorgna. On another day, they took a winery tour of Casali di Ama in the heart of the Chianti Classico region. Many of our Owners are serious wine collectors, and for those joining us on the trip, it was a chance of a lifetime they won’t soon forget. For lunch on the second day, Owners were given a delicious choice from Chef Daniele: tagliatelle with tomatoes and basil? Or tortellacci with ricotta, spinach butter and sage? These two iconic pasta dishes revealed the golden rule of Italian cuisine: there is beauty in simplicity. Most everybody loves pizza, but mastering the quintessential Italian-style pizza — with its crisp yet savory crust — is nothing short of an art form. If there was one souvenir from the trip that Owners relished the most, it was the knowledge on how to make an authentic Italian pizza at home. Chef Alessandro — who leads the pizza-making efforts at Casali di Casole — created a lively and interactive class for them which was followed by — what else? — a pizza dinner to enjoy the rewards of their hard work in the kitchen. The bond among Owners is incredibly strong, and trips such as this help to solidify old friendships as well as forge new ones. On the third night, one of our Casali di Casole owners hosted the group for cocktails at La Fornace. The evening embodied the cozy and convivial spirit of the four days perfectly. To wrap-up the memorable four days, owners were once again delighted by Chef Daniele’s authentic Italian cuisine at a lavish three-course gala dinner on the final night. Owners dined on risotto with shrimp, Tuscan-style fillet of beef and a decadent vanilla parfait with strawberries and aged balsamic vinegar. As the sunset on the Tuscan hills, Owners shared their experiences and toasted to an unforgettable four days of la dolce vita. Would you like to know more about ownership opportunities at Casali di Casole? Contact us today to learn more or to arrange a visit. As you begin to eye upcoming travel plans, take a second look at Tuscany in summer 2017. There are plenty of reasons that this is the perfect year to visit. From timeless annual rites — such as Il Palio in Siena or the 1398 Medieval Festival in Volterra — to this-year-only events, you should consider making your travel plans soon. Below you’ll find five reasons to enjoy la dolce vita this summer, including special events and packages at the five-star Casali di Casole — the perfect base to explore the best of Tuscany. Even in a nation saturated with stunning churches and cathedrals, Siena’s Duomo is a show-stopper. In 2017, visitors are being granted exclusive access to some of the Duomo’s most hidden chambers. From now until November 1, the Gate of Heaven Tour will grant a limited amount of visitors access to attic rooms that have previously been closed to the public. The tour includes views over the city from the Duomo’s cupola, as well as a high vantage point over the nave, which affords a new perspective on this architectural wonder. Learn more. Every Wednesday throughout summer, guests at the five-star Casali di Casole can join an exclusive tour that visits the beautiful Abbey di Passignano and concludes with a private tasting at the acclaimed Tuscan winery of Antinori. Food pairings help further illustrate the seductive qualities of Chianti Classico, Vino Nobile di Montepulciano, and the king of Tuscan wines, Brunello di Montalcino. Learn more. How can an event last 75 seconds and yet remain utterly timeless at the same time? Siena’s famous Il Palio is, at it’s heart, a horse race through the town’s majestic medieval piazza. But the pageantry that precedes it, and the revelry that follows, is deeply rooted in the customs and traditions of an ancient city and its rival neighborhoods, called contrade. Il Palio is held on July 2 and August 16 every year. And if you think it has been resurrected from the past to please tourists, think again: this intense battle of the contrade has been held almost continuously since 1644. The best way to enjoy Il Palio is with Casali di Casole’s special package. Learn more. Occupying a mountaintop in central Tuscany, the ancient walled city of Volterra captivates travelers with impeccably preserved cultural sites spanning the Etruscan, Roman and Medieval eras. Every summer, the spectacular 1398 Medieval Festival brings one of these time periods to life in the town’s Parco di Casali. Held on the third and fourth Sundays of August, the event features period costumes and reenactments in a medieval market setting. It is one of the most authentic time-traveling experiences in Europe. Finally, could there possibly be a better way to experience the undulating Tuscan countryside than with a test drive of a Ferrari? We didn’t think so. Guests at the Casali di Casole this summer can book the Ferrari Red Passion package and enjoy four nights of luxury accommodations, daily breakfast for two, VIP amenities, and of course, a full-day Ferrari experience with a member of the Ferrari team. Guests can take a red Ferrari California 30 for a spin anywhere within 150 km of the resort. Learn more about this, and other exciting summer 2017 packages at Casali di Casole. For the fourth year in a row, Casali di Casole – A Timbers Resort, has been ranked the best resort in Europe and among the very best in the world in Travel + Leisure's annual World’s Best Awards. Our former-10th-century-castle-turned-41-suite-boutique-hotel shines in Travel + Leisure’s prestigious rankings as the No. 1 Resort in Europe, No. 1 Hotel in Italy, and No. 15 among the 100 Best Hotels in the World by the magazine’s well-versed travelers. The Travel + Leisure readers define excellence in travel by rating their experiences and evaluating hotels across the world on the following characteristics: rooms and facilities, location, service, restaurants and food, and value. It isn't hard to see why they choose Casali di Casole year after year - the resort boasts more than 100 acres of vineyards and olive groves, a model game reserve, a state-of-the-art wellness center and spa, an infinity pool that overlooks the serene countryside, and some of the region’s finest cuisine. Guests and owners enjoy activities ranging from Italian and painting lessons to guided vineyard tours and truffle hunting adventures, as well as spa treatments among the olive trees. Casali di Casole even has a partnership with Ferrari to offer guests a day of luxurious driving through the countryside or an extreme race track experience. 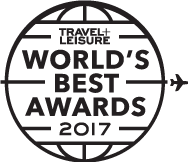 The 2016 World’s Best Awards lists, as well as survey methodology, are featured on travelandleisure.com now and will appear in the August issue. We are pleased to announce that two Timbers Resorts properties have received top honors from the discerning readers of Travel + Leisure in the 2015 World’s Best Awards. Casali di Casole – A Timbers Resort in Tuscany and The Sebastian - Vail – A Timbers Resort were named to the top 100 Hotels in the World and the Top Resorts in Europe and the U.S.
We invite you to celebrate with us by visiting these exceptional properties and seeing for yourself what makes them so special. Picture yourself arriving at a centuries-old castle at Casali di Casole for a magical getaway in the rolling hills of Tuscany, or being warmly welcomed to The Sebastian – Vail for a stay in a modern guestroom in the heart of beautiful and vibrant Vail Village. An exciting and incredible new benefit for Owners and guests of the hotel is the opportunity to get behind the wheel of a luxury Ferrari Sports Car, including the Ferrari 458 Spider and 458 Italia. Organized by the Siena-based DRIVING THE DREAM, drivers have the option to either take to the winding and picturesque roads of Tuscany on their own, or drive with an official Ferrari Instructor. It is possible to rent the car for a 1 hour test-drive, half day or whole day. Owners who rent the car for the majority of the day have the opportunity to visit Siena, the Chianti Region or shop at the Prada Outlets. By all accounts, this is an experience of a lifetime. Please visit our Facebook album to view photos from the recent Ferrari Drive experience visiting Casali di Casole. Tuesday Weekly Owners’ Cocktail Hour: Hosted each week in a different casale, this is a wonderful opportunity to mix and mingle with your fellow Owners and enjoy light Tuscan-style appetizers prepared by our Governante Orietta and her team served with Casali di Casole’s signature vintage Sangiovese/Cabernet blend or a crisp white wine from nearby Avignonesi. In the summer season we also have one Owners’ Reception each month at the Hotel. Fitness Classes and Personal Training: Expanded fitness class offerings now include Circuit Training, Zen Fit, Zen Imagery Exercises, Oxygen Pilates, together with classic Pilates and yoga classes. A dedicated personal trainer is also now available for circuit training or Pilates and yoga upon request. Daily Pasta and Pizza Making Classes: Hosted six days of the week, these classes are held at the hotel for adults. Children’s pizza-making classes and ice-cream tastings are also available. Thursday Wine Tastings: Led by Alessandro Marinelli, our Food & Beverage Director, these wine tastings offer the opportunity for Owners to learn more about vintages available locally as well as from afar. ‘Aperitivo Italiano’: Experience the Italian lifestyle and taste traditional Italian cocktails served with delicious finger food created by Chef Daniele each Friday. Cooking Lessons in your Casale: Chef Daniele’s team is now available for cooking lessons in your home. Authentic farm tours, expanded children’s classes and activities, new exclusive winery partnerships and dedicated wine programs are all available to Owners. For further details please contact the concierge team. Timbers Resorts’ properties, Casali di Casole in Tuscany, Italy and The Sebastian – Vail in Vail, Colorado, are honored to be included among the nominees in the 2015 Condé Nast Traveler Readers’ Choice Awards. A five-night stay for two in a suite at the Halekulani hotel in Honolulu, HI. An eight-day Romantic Danube cruise with Viking River Cruises for two in a Category A stateroom. Results will be published in the November 2015 issue. Limit one vote per person. Voting ends June 1, 2015. Vote + Enter for a Chance to Win a $10,000 Dream Vacation! Timbers Resorts is honored to be included among the nominees with Casali di Casole in Casole d'Elsa, Italy and The Sebastian - Vail in Vail, Colorado in the 2015 Travel + Leisure World’s Best Awards Survey. 2015 marks the 20th anniversary of the Travel + Leisure World’s Best Awards. Vote for your favorite travel experiences now by visiting tlworldsbest.com and enter for a chance to win a $10,000 dream trip, courtesy of Travel + Leisure. Your vote will contribute to the results, which will be revealed in the August 2015 issue of the acclaimed, luxury lifestyle publication. Limit one vote per person. Voting ends March 2, 2015. Giveaway is open to legal residents of the 50 United States and the District of Columbia, age 18 or older at time of entry. Void where prohibited. See Official Rules for details and how to enter the Giveaway without completing the survey.